This article is about the battalion. For the Abraham Lincoln Brigade, see XV International Brigade. The Lincoln Battalion was the 17th (later the 58th) battalion of the XV International Brigade, a mixed brigade of the International Brigades also known as Abraham Lincoln Brigade (Spanish: Brigada Abraham Lincoln). It was formed by a group of volunteers from the United States who served in the Spanish Civil War as soldiers, technicians, medical personnel and aviators fighting for Spanish Republican forces against the forces of General Francisco Franco and his Nationalist faction. The Lincoln Brigade was the first American military force to include blacks and whites integrated on an equal basis. Of the approximately 3,015 American volunteers, 681 were killed in action or died of wounds or sickness. 8 Anthem: "Valley of Jarama"
Washington, D.C., February 12, 1938. First National Conference of the Veterans of the Abraham Lincoln Brigade. From left to right: Francis J. Gorman, President of the United Textile Workers of America; Lieut. Robert Raven, wounded and blinded in Spain; and Commander Paul Burns. The Spanish Civil War was fought from 17 July 1936 to 1 April 1939 between the Republicans, who were loyal to the Spanish Republic, and the Nationalists, a rebel movement led by General Francisco Franco. Seeking assistance in combating the armed rebellion, the Republicans asked for volunteer fighters from all over the world. Americans volunteered and arrived in Spain in 1937. The Lincoln Battalion was organized in January 1937 as part of the XV International Brigade. The Lincoln Battalion initially fielded three companies, two infantry and one machine gun. Included were sections of Latin American and Irish volunteers, organized as the Centuria Guttieras and the Connolly Column, respectively. After less than two months of training, the Lincolns went into action in February 1937. Many of the volunteers recalled that training as, "They give me a gun and they give me 100 bullets and they send me to fight." The International Brigade was usually used as shock troops, and as a result they suffered high casualties. By the end of the war the Lincoln Battalion had lost 22.5% of its strength. The Lincolns suffered heavy losses during the Battle of Jarama. On February 27, 1937, the unit lost two-thirds of its strength, including their commander, Robert Hale Merriman (who was badly wounded), in a futile assault on Nationalist positions. The battalion remained in combat and was slowly rebuilt while maintaining its front-line positions. The unit was finally pulled out of the lines for a brief rest before the offensive at Brunete. Joined by the newly trained George Washington Battalion, the XVth Brigade went into action at Villanueva de la Cañada on the second day of the Brunete Offensive, and secured the town after hard fighting. The Washington's attacked the north end of the village, while the British and Dimitrov battalions attacked from the south. The XVth Brigade then deployed against "Mosquito Ridge," but, despite repeated assaults, they were unable to dislodge the Nationalist troops holding that key piece of terrain. The Lincoln's commander, Oliver Law, was killed during this action. The XVth Brigade again sustained heavy losses, and, due to the high rate of casualties, the Lincoln and Washington Battalions were merged. Thereafter, the unit was officially known as the Lincoln-Washington Battalion, though it was more commonly referred to as the Lincoln Battalion. During August, September and October the Lincoln-Washington Battalion fought in a series of battles in the Aragon Offensive. It fought well at both Quinto and Belchite. The engagement at Quinto was a combined arms action as the Lincoln-Washington Battalion was led into their second assault on the town by Russian built T-26 tanks. Belchite was a hard battle with house-to-house fighting that produced heavy casualties. After Belchite the XVth Brigade was again reorganized. The newly formed Canadian MacKenzie-Papineau Battalion joined the brigade and the veteran Dimitrov Battalion departed. A majority of the volunteers in the "Mac-Paps" were actually Americans. On October 13, 1937 the XVth Brigade fought at Fuentes de Ebro. Men from the brigade's 24th (Spanish) Battalion rode Russian tanks into the attack. The remaining battalions were supposed to follow the tanks, but the attack fell apart as the tanks did not coordinate their advance with the infantry. Casualties were especially heavy in the 24th and MacKenzie-Papineau Battalions. After Fuentes the XVth Brigade was pulled back to a reserve position where it received its first extended period of rest and relaxation since going into combat at Jarama. In late December the Lincoln-Washington Battalion was alerted for service at Teruel. The XVth Brigade was deployed to hold the recently captured city of Teruel against the expected Nationalist counterattack. The winter of 1937/38 was among the coldest on record, and many troops suffered frostbite during the campaign. The Lincoln-Washington's initially held positions overlooking Teruel that they called the North Pole. Later they moved down into the city. During January, the Nationalists launched coordinated attacks against the Republican defenses. The XVth Brigade's British Battalion and MacKenzie-Papineau Battalion both lost an entire company attempting to hold the territory. Nationalist superiority in both numbers and material eventually pushed the XVth Brigade out of Teruel. The XV BDE, including the Lincoln-Washington Battalion, were pulled out of the line for rest after three weeks in the lines. But before the units could get to the rest areas, their trains and trucks were stopped and they were re-deployed to the front where they participated in an offensive that was expected to relieve some of the pressure on Teruel. In a dawn attack the XVth Brigade attacked a series of Nationalist fortifications at Segura de los Baños. While the attack was a success, the Nationalist forces did not transfer any forces away from Teruel. March found the Lincoln-Washington in reserve positions in Aragon. Their rest proved short-lived as the XVth Brigade was swept up in the disaster known as The Retreats. Nationalist forces punched through the Republican lines and drove to the sea, cutting the Republic in two. The Lincoln-Washington Battalion was dispersed, reformed and dispersed again in a confused series of holding actions and retreats in which it lost most of its personnel killed, captured or missing. Robert Merriman and Dave Doran, two of the highest ranking American officers in the XVth Brigade, were presumed captured and executed as Nationalist forces normally executed all international prisoners. The remnants of the Battalion gathered on the far side of the Ebro River, where they were slowly reconstituted with a limited number of international volunteers from the hospitals and rear areas. Spanish troops, many young conscripts, were drafted into the XVth Brigade's battalions to bring them fully up to strength. Spaniards were integrated into the Lincoln Battalion as early as Jarama. As the flow of volunteers decreased from North America, Spanish companies were added to the international battalions. After the Retreats, Spanish troops were integrated across all of the battalions and comprised the majority of the XVth Brigade's strength in its last action. In July 1938, the rebuilt Lincoln-Washington Battalion participated in the Ebro Offensive. The XVth Brigade crossed the Ebro and rapidly advanced across territory they had retreated through in March and April. However, the Nationalist forces quickly rallied and the offensive stalled. The Republicans forces changed back to the defensive, contesting the area that had been captured in the offensive. The International Brigades were withdrawn from battle by the Spanish prime minister, Juan Negrín, in 1938 in the vain hope that the Nationalists would withdraw their German and Italian troops in turn. Surviving Americans from across Spain were sent to Ripoll, where the International Red Cross and the US government verified their nationality before repatriating them. Many were able to participate in the farewell activities, including a parade in Barcelona where the International Brigades were officially disbanded. Most American volunteers returned to the US between December 1938 and January 1939. American POWs were released after the fall of the Republican government, although the last POWs did not arrive in the United States until September 1939. The Brigade was a cause célèbre in some liberal and socialist circles in the United States. The Friends of the Abraham Lincoln Battalion (FALB), assisted by many other groups, conducted fundraising activities and supply drives to support the Americans in Spain. News of the brigade's high casualty rate and bravery in battle made them heroic figures to Americans opposing the rise of fascism. The Abraham Lincoln Battalion and its successor the Lincoln-Washington Battalion was manned by 3,015 American soldiers during the course of the war. While several of these soldiers also held citizenship in other countries, they identified primarily as Americans. Approximately 1,681 of these men also served in the Mackenzie-Papineau of "Mac-Pap" battalion as heavy losses in both battalions led to mergers and transfers of men. Many of the soldiers were either first or second generation immigrants, and the battalion was overwhelmingly white. While the Lincoln soldiers were not unusually young compared to their fellow international combatants, they did often arrive at the age of 16. Americans usually entered Spain by first emigrating to France because the United States Government was not issuing visas to Spain as part of its non-intervention policy. Few American soldiers arrived after September 1937. Battalion members fought for many different reasons. For the 85 African-American members of the battalion, the Nationalists represented all the injustices they faced back in the US. The Nationalist army consisted of colonial troops ruling over Africans or of conscripted Muslim soldiers who enlisted to escape poverty. Furthermore, Franco was supported by Mussolini's Fascist Italian army and air force which had only recently conquered the African nation of Ethiopia, a beacon of Black nationalism around the globe. Several Fascist leaders also characterized the war as a crusade against the "Africanization" of Spain despite the fact that it was the Nationalists who relied on African fighters. Langston Hughes, a journalist for the Baltimore Afro-American at the time, wrote, "Give Franco a hood and he would be a member of the Ku Klux Klan." Though the Lincoln Battalion was largely white, it was the first integrated American unit in American history. Most of the original volunteers in the battalion were communists or Soviet sympathizers. It is difficult to list exactly how many members of the battalion were communists because political ideology was not a litmus test for serving in the war. Historians and veterans of the battalion estimate that between 50 and 80% of the battalion were actively communist. It is certain though that the vast majority of the commanding officers were communists. Unlike most of their European counterparts, the Americans in the International Brigade were much more likely to be students and to not have ever seen military service before the war. Not all combatants were motivated by ideological or political concerns. As Mo Fishman, a veteran of the battalion, recalled in 2006, "Some men were running away from bad marital or love situations, but what united all of us was that we hated fascism." Anti-fascism, more than any other single factor, is what motivated and united the volunteers of the Lincoln Battalion. An American company served in the 20th International Battalion that was attached to the 86th Mixed Brigade. This unit fought on the Cordoba Front. Most of the American volunteers were transferred from the unit to the XVth Brigade prior to the Brunete Offensive. The Washington Battalion was the second American battalion. The unit was merged with the Lincoln Battalion during the Brunete Campaign. It was commanded by Mirko Markovics and its commissar was Dave Mates. Two-thirds of the nominally Canadian unit were Americans. Its first commander was Robert Thompson, an American veteran of the Lincoln Battalion. Joseph Dallet, also American, was the first Commissar. The Regiment de Tren was a transportation unit providing support to the Republican forces. The Second Squadron was predominately American. The commander was Durward Clark. This unit's official title was the 14th Battery, 2nd Group, 11th Regiment. It was a heavy artillery unit manning 155mm guns. The battery commander was Arthur Timpson, with Jack Waters as Commissar. This unit initially manned 155mm guns but were later equipped with 45mm anti-tank guns and were included in the 129th International Brigade. The battery commander was Nathan Budish, and his Commissar was Sid Kaufman. Organized by Dr. Edward K. Barsky, the American Medical Bureau (AMB) recruited doctors, dentists, nurses, administrators and ambulance drivers to support the Spanish Republic. In its fund raising events the names 'American Medical Bureau to Save Spanish Democracy' and 'Medical Bureau & North American Committee to Aid Spanish Democracy' were also used. In the United States the AMB staged events in order to try to shift public opinion away from supporting the aid boycott to the Spanish Republic imposed by the American government following the agreements of the Non-intervention Committee. In Spain the AMB was assigned to hospitals and medical centers of the Spanish Military Medical Services (Cuerpo de Sanidad), such as the Gómez Ulla Military Hospital in Madrid, and also to front-line locations. AMB members, who also included women, treated both international as well as Spanish combatants. By the end of the war a majority of both the Spanish aid committees and the leadership councils of the AMB were women. Many women leaders in the aid movement were wives of either prominent American leftists or soldiers in the Lincoln Battalion. Katherine Duncan, wife to Governor La Follette's secretary, and Peggy Dennis, a communist party leader, were leaders in the active Madison, Wisconsin chapter. Marion Merriman, wife to Abraham Lincoln Battalion commander Robert Merriman (the supposed inspiration of Hemingway's hero in For Whom the Bell Tolls), was the chairwoman of the large San Francisco branch of the organization. She and one other woman, Fredericka Martin, hold the honor of being the only woman to receive officer commissions from the Spanish Republic. Evelyn Hutchins, an active member of the AMB, agitated for years to be a hospital driver on the front-lines, but Spanish Republican policies prevented women from serving on the front-line until 1938 when Hutchins won the right to serve on the front-line as a driver. 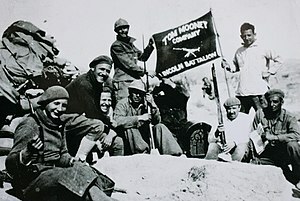 During and after the Spanish Civil War, members of the brigade were generally viewed as supporters of the Soviet Union. 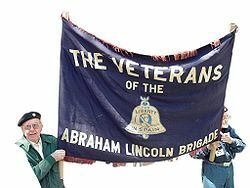 After returning to the United States, many joined the Veterans of the Abraham Lincoln Brigade (VALB). However, the Molotov–Ribbentrop Pact caused a division among the Lincoln Brigade veterans. Some of them, adopting the official Communist line that regarded the war in Europe as "an imperialist war", joined with the American Peace Mobilization in protesting U.S. support for Britain against Nazi Germany. Others, however, persisted with the anti-Fascist line which they had followed to Spain. After the German invasion of the Soviet Union, the VALB changed its stance and fully backed the war. Former Lincoln-Washington commander Milton Wolff volunteered in 1940 for the British Special Operations Executive, and arranged the provision of arms for the European resistance organizations. During World War II the U.S. government considered former members of the brigade to be security risks. In fact, FBI Director J. Edgar Hoover requested that President Roosevelt ensure that former ALB members fighting in U.S. Forces in World War II not be considered for commissioning as officers, or to have any type of positive distinction conferred upon them. In 1947, the Veterans of the Abraham Lincoln Brigade were placed on the Attorney General's List of Subversive Organizations. The Veterans would be one of only five groups that would stay intact, to at least 1970, after receiving this designation. Once the US entered World War II, the Federal Bureau of Investigations recommended that all veterans of the Lincoln Battalion be denied military promotion as so as to prevent communists from rising in the armed forces. After World War II ended, veterans of the Lincoln Battalion were denied military enlistment, government jobs and, according to some, were even fired by their employers. The House Un-American Activities Committee also blacklisted the names of all veterans of the Lincoln Battalion. Veterans were fired, denied housing and were refused passports for decades. The FBI has denied that it maintained any files on the veterans of the Lincoln Battalion, but veterans groups claim that the federal government is merely covering up its crimes. The last known surviving member of the Lincoln Battalion, Delmer Berg, died on February 28, 2016 at the age of 100. James Walker Benét – Author and journalist (San Francisco Chronicle). Alvah Bessie – Hollywood screenwriter who was one of the Hollywood Ten. Delmer Berg – Union organizer. Herman Bottcher – Earned two Distinguished Service Crosses in World War II. Edward A. Carter, Jr. – Earned the Medal of Honor in World War II. Carmelo Delgado Delgado – Puerto Rican nationalist, among the first U.S. citizens to die in the war. Leo Eloesser – Noted US thoracic surgeon. Moe Fishman – co-founder and Executive Secretary/Treasurer of the Veterans of the Abraham Lincoln Brigade. John Gates – Political Commissar of the Battalion, later editor of The Daily Worker. Robert Klonsky – One of the defendants in the Smith Act trial of the mid-1950s. George Sossenko – Also fought in the Durruti Column. Robert G. Thompson – Awarded the Distinguished Service Cross in World War II; among the 1950s Smith Act trial defendants. Harry Wayland Randall – Chief Photographer of the Photographic Unit of the 15th International Brigade. Currently, there are four memorials dedicated to the veterans of the Abraham Lincoln Brigade. The fourth memorial commemorates the students and faculty of The City College of New York (CCNY) who fought in the Spanish Civil War, including the thirteen alumni who died in that war. The memorial is located in the North Academic Center of CCNY. In 2007, the exhibit Facing Fascism: New York and the Spanish Civil War at the Museum of the City of New York examined the role that New Yorkers played in the conflict, as well as the political and social ideologies that motivated them to participate in activities ranging from rallying support, fundraising, and relief aid, to fighting—and sometimes dying—on the front lines in Spain. ^ Garcia, Daniel Pastor, Celeda, Antonio R. "The Victors Write History, and the Vanquished Literature: Myth, Distortion and Truth in the XV Brigade," Bulletin of Spanish Studies no. 89 (2012): 311–312. ^ a b c Lyden, Jacki. "Spanish Civil War Volunteers Revisit Battlegrounds," National Public Radio, October 8, 2006, accessed March 29, 2015, https://www.npr.org/templates/story/story.php?storyId=6221378. ^ Payne, Stanley G. The Spanish Civil War. New York: Cambridge University Press, 2012. 154. ^ Thorpe, Richard (2009) "A Brief History of the British Battalion of the International Brigades, 1936 -1938" Archived 2013-09-27 at the Wayback Machine Retrieved 13 August 2013. ^ Garcia, Daniel Pastor, and Celeda, Antonio R. "The Victors Write History, and the Vanquished Literature: Myth, Distortion and Truth in the XV Brigade," Bulletin of Spanish Studies no. 89 (2012): 307–321. ^ Soto, Isabel. "'I Knew that Spain Once Belonged to the Moors': Langston Hughes, Race, and the Spanish Civil War," Research in African Literature vol. 45 (2014): 134. ^ Garcia, Daniel Pastor, and Celeda, Antonio R. "The Victors Write History, and the Vanquished Literature: Myth, Distortion and Truth in the XV Brigade," Bulletin of Spanish Studies no. 89 (2012): 310. ^ Soto, Isabel. "'I Knew that Spain Once Belonged to the Moors': Langston Hughes, Race, and the Spanish Civil War," Research in African Literature vol. 45 (2014): 137. ^ Garcia, Daniel Pastor, and Celeda, Antonio R. "The Victors Write History, and the Vanquished Literature: Myth, Distortion and Truth in the XV Brigade," Bulletin of Spanish Studies no. 89 (2012): 312. ^ "Abraham Lincoln Battalion," last modified June 27, 2013, http://0-www.britannica.com.dunnlib.simpson.edu/EBchecked/topic/1586/Abraham-Lincoln-Battalion. ^ Arthur Landis (1967) The Abraham Lincoln Brigade, pp. 138–139. ^ Shairo, Martin F. (1 July 1982). "Medical Aid to the Spanish Republic During the Civil War (1936-1939)". Ann Intern Med. 97 (1): 119–124. doi:10.7326/0003-4819-97-1-119. ^ Graham, Helen. The Spanish Civil War: A Very Short Introduction. New York: Oxford University Press, 2005, 40–45. ^ a b c Haynes, John Earl, and Klehr, Harvey. "The Myth of 'Premature Fascism'," New Criterion vol. 21 (2002): 19-26. ^ "Delmer Berg, Last of American Volunteers in Spanish Civil War, Dies at 100". The New York Times. 3 March 2016. Retrieved 12 June 2016. ^ "REISS, David Morris". SIDBRINT. University of Barcelona. Retrieved 21 October 2018. ^ Martin, Douglas (January 17, 2008). "Milton Wolff, 92, Dies; Anti-Franco Leader". The New York Times. Retrieved 2008-03-25. ^ Nolte, Carl (2012-12-22). "Author, activist James Benét dies at 98". San Francisco Chronicle. Retrieved 2013-01-08. ^ "Guide to the Veterans of the Abraham Lincoln Brigade Records ALBA.019". Archived from the original on 7 February 2012. Retrieved 12 June 2016. Beevor, Antony. The Battle for Spain, 2006. Bermack, Richard. The Front Lines of Social Change: Veterans of the Abraham Lincoln Brigade, Heyday Books, 2005. Bradley, Ken International Brigades in Spain 1936–39 with Mike Chappell (Illustrator) Published by Elite. ISBN 978-1855323674. Brandt, Joe (Ed.). Black Americans In The Spanish People's War Against Fascism 1936–1939. New York: Veterans Abraham Lincoln Brigade, no date, ca. 1979. Carroll, Peter N. The Odyssey of the Abraham Lincoln Brigade, Stanford: Stanford University Press, 1994. Carroll, Peter N.; James D. Fernández (2007). Facing Fascism: New York and the Spanish Civil War. New York University Press. Eby, Cecil. Between the Bullet and the Lie: American Volunteers in the Spanish Civil War, New York: Holt, Rinehart & Winston, 1969. Eby, Cecil. Comrades and Commissars, University Park: The Pennsylvania State University Press, 2007. Geiser, Carl. Prisoners of the Good Fight, Westport, CT: Lawrence Hill and Company, 1986. Glazer, Peter. Radical Nostalgia: Spanish Civil War Commemoration in America. New York: University of Rochester Press, 2005. Johnson, Verle B. Legions of Babel, University Park: The Pennsylvania State University Press, 1967. Landis, Arthur. The Lincoln Brigade. New York: The Citadel Press, 1967. Orwell, George. Homage to Catalonia, 1938. Osheroff, Abraham. "Dreams and Nightmares", 1974. Rolfe, Edwin. The Lincoln Battalion: The Story of the Americans Who Fought in Spain in the International Brigades, New York: Random House, 1939. Rosenstone, Robert A. Crusade of the Left, New York: Pegasus, 1969. Thomas, Hugh. The Spanish Civil War, 4th Rev. Ed. 2001. Yates, James. Mississippi to Madrid: Memoir of a Black American in the Abraham Lincoln Brigade. Seattle: Open Hand Publishing, 1989. Wikimedia Commons has media related to Abraham Lincoln Brigade. Online guide to the archives of the Lincoln Brigade, Tamiment Library (New York). McArdle, Joe. The Spanish Civil War and the Pacific Northwest, Great Depression in Washington State Project. This page was last edited on 17 February 2019, at 08:13 (UTC).